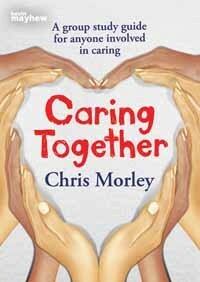 Welcome to this website which provides information about Caring Together, a study guide for carers. The best way to get a flavour of the course is to click on one of the sample sessions (Session Three – Failure, Session Nine – Growing through Pain). Much of the material on this site provides additional information for those who want to take their thinking further so some of the material here only makes sense when used in conjunction with what’s in the book. Browsing through the sample sessions above will give a clearer idea of how the book fulfil its main function of encouraging and supporting carers in their task. Every congregation is likely to have on average one carer for every ten worshippers but carers are a group whose specific needs many churches don’t address. This book suggests how a group to support them might be organised and offers a range of material for discussion and reflection. In addition to those whose caring role is formally recognised, many worshippers will have parents who need caring for or will have taken on some responsibility for a neighbour or friend who need support or who are involved in pastoral care within the congregation. Anybody in this sort of situation will find the material in the book helpful, particularly if used in a group, though using it as basis for individual reflection will also be fruitful. Those offering training in pastoral care will also find valuable resources here.